The Natural Products Foundation (NPF) Board of Directors recently met with Dr. Daniel Fabricant, Director of FDA’s Division of Dietary Supplement Programs, to discuss the progress of the NPF Truth in Advertising program. The meeting focused on the continuing role NPF may play in industry education. The NPF advertising review process is a pro-active effort targeting non-compliant dietary supplement ads. Reviews specifically investigate advertisements that claim to treat or mitigate disease. During 2010-2011, NPF has mailed 130 warning letters to companies responsible for marketing dietary supplements. The Truth in Advertising review process is initiated by Foundation staff members under the supervision of the NPF Legal Advisory Council. The current Legal Advisory Council members are Mr. Ullman (Ullman, Shapiro & Ullman), Jackie Kuler (Gronek & Associates), and Nicholas Licato (Nexgen Pharma). The program is overseen by Mr. Ullman and NPF Executive Director Deb Knowles. The majority of companies contacted through Truth in Advertising efforts have brought their promotional materials into compliance. When companies refuse or fail to amend illegal advertising practices, NPF refers the matter to the Federal Trade Commission (FTC) and the US Food and Drug Administration (FDA). In 2010-2011, NPF has referred 25 cases to federal agencies. Studies suggest that globally people do not get enough vitamin D, and a lack of vitamin D may lead to serious health problems. Adding to evidence shown that getting plenty of vitamin D may help protect against chronic diseases such as cancer, a study in the Journal of Clinical Oncology affirms these findings, suggesting that higher blood levels of vitamin D may lower their risk of colorectal cancer by more than 30%. In this analysis, researchers reviewed data from 17 studies that included more than 13,000 participants, and looked at how much vitamin D people consumed through diet and supplements and examined whether there is a link between vitamin D blood levels and the risk of colorectal cancer. Blood levels of vitamin D were determined by measuring 25-hydroxyvitamin D.
People with the highest vitamin D intake had a 12% lower risk of colorectal cancer and people with the highest blood levels had a 33% lower risk, compared with people with the least intake and the lowest blood levels. Higher vitamin D was linked to an equal lowered risk for both colon cancer and rectal cancer. Keep in mind that since the studies reviewed in this report were observational, they do not prove cause and effect. But they suggest an interesting association, which should be explored further through randomized, controlled trials. Know your vitamin D levels. Talk with a doctor about the benefits of having your vitamin D level checked to find out whether you are getting enough vitamin D. If your doctor determines that your levels are low, talk about how to optimize vitamin D intake and whether or not a vitamin D supplement is appropriate for you. Get your vitamin D. Vitamin D may come from exposure to sunshine, through the diet or through supplements. Food sources include vitamin D–fortified beverages and oily fish such as salmon and mackerel. Take preventive steps. Many people could help prevent colorectal cancer through healthy lifestyle behaviors and routine preventive screenings,such as having your stool checked for blood and regular colonoscopies. To help optimize your health and prevent disease, talk with a doctor about preventive steps recommended for your age and medical history. Again and again, FTC has made clear through its declarations and actions that there are some things that simply will not be tolerated in terms of dietary supplement advertising claims. FTC enforcement has long focused on claims of rapid weight loss, along with supposed “miracle cures,” according to Marc Ullman, partner in Ullman, Shapiro & Ullman, LLP, New York, NY and chairman of the Legal Advisory Council of the Natural Products Foundation (NPF), Washington, D.C. “The commission has made it clear that it is of the opinion that without lifestyle changes, no pill is going to cause weight loss, whether it’s a pharmaceutical or a dietary supplement,” says Ullman, whose law firm’s work includes U.S. Food and Drug Administration (FDA) and FTC compliance issues. This work entails helping companies identify product claims that may raise red-flags with regulators, and helping to ensure a proper understanding of the level of scientific substantiation required to make claims. These types of unlikely claims, whether the company believes they are backed by legitimate evidence or not, tend to invite FTC inquiry, in Ullman’s experience. The faith in some strategies meant to keep FTC at bay, such as disclaimers about “typical results,” or the placement of a footnote about “diet and exercise” in an advertisement with overreaching weight loss claims, may be unfounded. Ullman says the commission has made clear that these inclusions will not deter them from taking a hard look at a misleading advertisement. Where will the agency’s regulatory focus fall in the coming months and years? Within the food and beverage industries, the primary control measure used to preserve the freshness and prevent spoilage is the pasteurization process. Spoilage bacteria are always present in the processing of food materials, and usually will not induce illness if ingested. However, pathogenic bacteria will cause illness, and foods left exposed at unsafe temperatures in the “Danger Zone” between 40º F and 140ºF for extended periods could be dangerous to eat. In general, it only takes twenty minutes for bacteria to double in number; so, that pitcher of juice, potato salad, or bottle of dressing could become a toxic microbial side dish in very little time at room temperature. Proper handling, preparation, and preservation of foods readily control common pathogens like Escherichia coli O157:H7, Salmonella, Staphylococcus, Streptococcus spp., and Pseudomonas aeruginosa, which is an opportunistic pathogen. As such, the Food and Drug Administration (FDA) has outlined preparative control procedures to ensure the safety of food products. They require manufacturing plants to ensure that the processing conditions of foods results in at least a 5-Log reduction of microbial species present in the foods. This does not mean that the microorganisms present are completely eliminated, just that they are controlled so that continued careful handling will prevent food borne illness. To extend the shelf-life of ingestible products, manufacturers frequently rely upon the addition of preservatives to processed foods. They are added to compensate for the consumer who may open and close a bottle or jar multiple times, and with each opening inoculate the food with environmental microbiological contaminants. Without the preservatives, the food would spoil very quickly and would have to be disposed of. Just think of how many times a bottle of salad dressing may be opened and closed again before being fully consumed! Preservatives, however, should never be added to compensate for a faulty processing system. Manufacturers must ensure that their water systems and all the control steps, such as sanitation and pasteurization (typical batch pasteurization is at a temperature of >145º F for 30 minutes or HTST at 185º F for 15 seconds), are implemented with processing and packaging systems to bring the finished product into a compliant and safe microbial status, prior to preservatives being added. Story Source: The above story is reprinted from materials provided by Michael Kralik, PhD (with editorial adaptations by Natural Products Foundation staff). Dr. Kralik is the current Director of Corporate Quality at Alix Technologies, Inc.
Shop Amazon.com through the Natural Products Foundation and a portion of your total purchase price comes back to support NPF activities. It couldn't be easier. Simply access Amazon through the NPF websites naturalproductsfoundation.org and naturalproductsinfo.org and the Foundation will get a portion of the purchase price of everything you buy on the site! 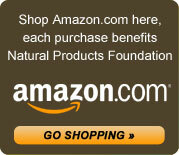 The next time you want to make a purchase through Amazon, access the site through the Foundation websites, or bookmark Amazon.com in your browser through the url naturalproductsfoundation.org/amazon. Whether you're purchasing books, electronics, movies, music, clothing, or anything at all that Amazon offers, you will be helping to maintain our industry's vitality as well. Industry members are honoring John R. Carlson, in accordance with family wishes, with memorial contributions to the Natural Products Foundation (NPF). John R. Carlson, one of the natural health industry’s national leaders, co-founded J.R. Carlson Laboratories with his wife Susan in 1965. Mr. Carlson was an advocate for natural products for nearly five decades. “NPF is honored that John’s family has chosen our organization to commemorate their father’s pioneering work in the field. More than $15,000 has been donated from companies and individuals across the industry since John’s death on October 1. All memorial contributions support programs to improve the integrity of natural products, as John did himself throughout his lifetime,” said Derek Hall, NPF Chairman. Dedicated to the natural supplement industry, Mr. Carlson was an active member of many industry organizations, including the Natural Products Association. The industry recognized his service on many occasions, including with the NPA Crusader Award in 2001. John was also an active member of The American Academy of Anti-Aging Medicine, The National Institute of Nutritional Education, The Mid American Health Organization and a founding member of the health activists group “Citizens for Health”. In 2009, John received the prestigious Nutrition Business Journal Summit Lifetime Achievement Award, recognizing him as a pioneer that helped build the natural products industry. In addition to his vast contributions to the natural industry, Mr. Carlson will also be remembered for his warmth, kindness, generosity, and integrity. Natural Products Foundation, 1773 T St. NW, Washington, DC 20009. Parents looking for surefire ways to boost their kids’ brain power, improve behavior and set the foundation for lifelong heart health need to go fish – for fish oil supplements, that is. Fish oils provide the longer chain omega-3 fatty acids EPA (eicosapentaenoic acid) and DHA (docosahexaenoic acid). DHA is the most abundant long chain fatty acid in brain and retinal cells, and getting off to a good start in life with a high level of DHA has been linked to better eyesight, better learning ability and improved behavioral development. In one study, infants given DHA supplemented formula for the first 6 months of life had significantly higher IQ scores at age 4 when compared to unsupplemented infants. In another recent University of Texas study, healthy formula-fed infants received either DHA formula or unsupplemented formula until age 12 months. At age 18 months the DHA group had superior mental development and language scores compared to the unsupplemented babies. Studies show that children with ADHD typically have significantly lower concentrations of omega-3 fatty acids. At Oxford University in the UK, Dr. Alexandra Richardson found children with dyslexia and ADHD tendencies experienced improved concentration, decreased anxiety and a reduction in disruptive behavior after three months of fish oils. In one of Dr. Richardson’s trials, children with oppositional defiant behavior and attention deficit, who often have difficulty reading, had significant improvement in their behaviors and their reading and spelling scores after 15 weeks of EPA supplementation. Her approach used 170 mg of DHA plus 558 mg of EPA. Japanese researchers found that when using a higher omega-3 dose with 514 mg of DHA plus 100 mg of EPA daily for 60 days in children aged 6-12 years, the children who got the treatment demonstrated a significant reduction in aggressive behavior compared to the control group. There are more reasons for boosting a child’s intake of DHA and EPA. Toddlers with higher levels of DHA have fewer respiratory infections, less tendency toward allergies and less eczema. Finally, consider the heart health benefits of EPA and DHA. Having an omega index of 8% or better, determined by an “Omega Index” blood test, is linked to a 90% reduction in heart disease incidence. In a child that level would require an intake of about 500 mg of combined EPA and DHA daily. Story Source: The above story is reprinted (with editorial adaptations by Natural Products Foundation staff) from materials provided by Jolie Root, LPN, LNC. References: Drover JR, Hoffman DR, Castañeda YS, Morale SE, Garfield S, Wheaton DH, Birch EE. Cognitive function in 18-month-old term infants of the DIAMOND study: a randomized, controlled clinical trial with multiple dietary levels of docosahexaenoic acid. Early Hum Dev 201;87:223-230. Richardson, A. J., and Montgomery, P. The Oxford-Durham Study: A randomized, controlled trial of dietary supplementation with fatty acids in children with developmental coordination disorder. Pediatrics. 115(5): 1360-1366, 2005. Hirayama, S., et al . Effect of docosahexaenoic acid-containing food administration on symptoms of attention-deficit/hyperactivity disorder - a placebo-controlled double-blind study. Eur. J. Clin. Nutr. 58: 467-473, 2004. Botanical products have been used for medicinal purposes by human civilizations over the course of thousands of years. Not surprisingly, many of the pharmaceuticals used today are derived in part from natural substances. Flavonoids are an excellent example of a safe and effective botanical compound that has natural biological activity in physiologic processes. In general, flavonoids are found in colored fruits, vegetables and spices as well as cocoa, teas and even red wine. When your parents said, “Eat your vegetables,” they really meant, “Eat your flavonoids, because they have health benefits!” Lycopene, resveratrol, baicalin, catechin, curcumin, and quercetin are examples of flavonoid ingredients with therapeutic effects which can be found OTC in dietary supplement products and by prescription in medical food products. Flavonoids have been known for decades to promote anti-inflammatory activity, and flavonoid molecules have recently entered osteoarthritis clinical trials with successful results. Why look at flavonoids in osteoarthritis studies? There are multiple underlying causes and contributing factors to osteoarthritis including trauma, repetitive motion, inflammation, obesity, genetic predisposition and diet. Recently, with a substantial increase in our understanding of the problem, the roles of nutrition and lifestyle have become important focal points for osteoarthritis concerns. Many scientific studies have shown that anti-inflammatory micronutrients like flavonoids help the body naturally manage inflammation and oxidation, two important factors in osteoarthritis. There are literally thousands of papers in scientific literature related to flavonoids. The goal of a nutritional, metabolic therapy for osteoarthritis is to manage inflammation and oxidation. Botanical flavonoid molecules have been shown to manage osteoarthritis as suggested by modulating the production of inflammatory oxidized lipids, while reducing and controlling induced inflammatory molecules. Unfortunately, by eating large amounts of processed food, too much red meat and few colored fruits and vegetables, we usually don’t get a high enough intake of the nutrients we need to nutritionally manage the chronic progression of osteoarthritis over time. So, make sure to eat plenty of colored fruits and vegetables, and consider dietary products that contain concentrated and purified flavonoids to either maintain joint health or to help to nutritionally manage the metabolic processes of osteoarthritis. Natural resources taken under the care of your physician may be very effective in helping osteoarthritis. Story Source: The above story is reprinted (with editorial adaptations by Natural Products Foundation staff) from materials provided by J.D. Weir, President and CEO of Primus Pharmaceuticals and Secretary of the NPF Board of Directors. For more information, please click here: The Role of Flavonoids in Osteoarthritis. 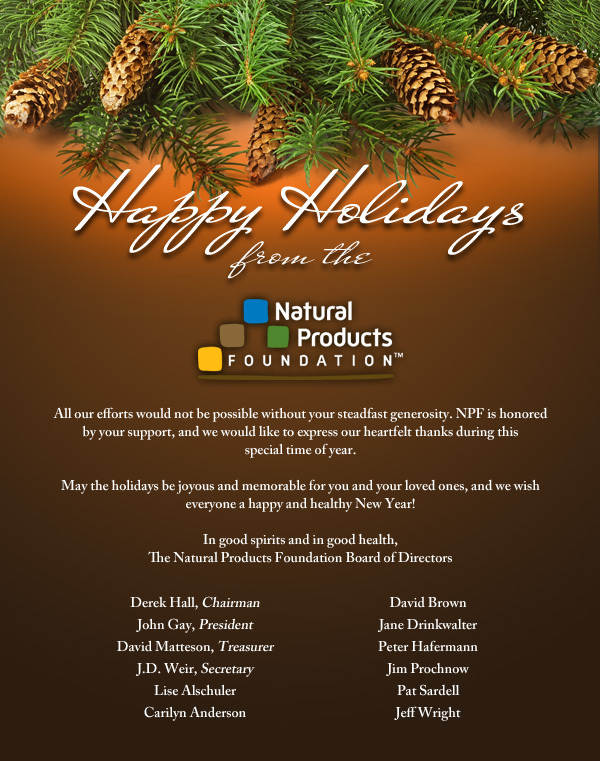 The Natural Products Foundation (NPF) announced today the election of Lise Alschuler and Jeff Wright to the NPF Board of Directors. Dr. Alschuler and Mr. Wright will join the NPF governing body effective immediately for a three-year term. Dr. Alschuler is the Vice President of Quality and Education at Emerson Ecologics. Emerson Ecologics, LLC is the leading provider of professional-grade nutritional supplements, products and services to the integrative healthcare community. Dr. Alschuler is board certified in naturopathic oncology and has been practicing naturopathic medicine since 1994. Dr. Alschuler is past-President of the American Association of Naturopathic Physicians. She is co-author of The Definitive Guide to Cancer: An Integrative Approach to Prevention, Treatment and Healing (2010) now in its 3rd edition and Five to Thrive: Your Cutting Edge Cancer Prevention Plan (Oct. 2011). Jeff Wright is the current President of the Natural Products Association (NPA). Wright has been active in NPA for nearly two decades, serving on the NPA-South regional Board and the national NPA Board of Directors. Wright became President of NPA in the summer of 2011, and will serve in that capacity for the next two years. Jeff is the owner of Wright’s Nutrients, a retail store in New Port Richey, Florida. A premier vitamin and organic grocery, Wright’s Nutrients has been family owned and operated since 1994. “With the election of Lise Alschuler and Jeff Wright to the NPF Board of Directors, our organization adds diversity and a wealth of personal expertise to our leadership,” said Derek Hall, NPF Board Chairman. “Dr. Alschuler and Mr. Wright have devoted their careers to natural health, and they possess expansive knowledge of the field. Their guidance and unique professional perspectives will be great resources for the industry over the coming years. NPF's mission is to promote and facilitate research and education related to natural products, and we are very pleased to have Lise and Jeff leading our ongoing efforts. Their addition on the Foundation Board will help ensure that we advance toward a stronger future, one that benefits both consumers and industry. Never heard of acidosis? You’re probably not alone. It could become as common a health term as cholesterol in the near future. Natural health experts have long understood the relationship between good health and good pH balance in the body – the balance of acidity and alkalinity. Now, the mainstream medical community is catching on, too. The modern western diet, with its emphasis on proteins, sugars, and processed foods, generates considerable amounts of acid in the body. The aging process and high levels of stress are known to do the same. With so many people experiencing these three factors, and others, there are more and more people experiencing the negative health consequences associated with too much acid in the body – metabolic acidosis. This is a condition that occurs when the body’s ability to naturally buffer acid in the body can’t keep up with the acidic load. “Acidosis is a real phenomenon . . . that should be recognized and treated,” is the finding of a recent monograph published in the prestigious British Journal of Nutrition. After examining more than 400 peer-reviewed, published studies, the authors affirmed that even low levels of acidosis can impair the body’s natural ability to manage a wide range of chronic conditions. Acidosis is a natural by-product of metabolism (how the cells produce energy) generating waste and this waste is acidic. The body has a variety of ways it buffers this acid, including the respiratory and blood filtering systems. When those systems can’t keep up the body has emergency backup systems to handle the load. It will pull calcium out of the bones and break down muscle to increase its buffering ability. The problem today is that acute acidosis is no longer an occasional occurrence that the body can accommodate without negative effects; it has become chronic. The result is the body is under continual acidic stress, which in turn diminishes its ability to ward off disease. The good news is that as acidosis becomes better understood, there are expanding solutions to help people manage their pH balance. More people are conscious about and making better choices in their diets, lowering the consumption of acid-producing animal products like meat, eggs and dairy, white flour and sugar, and increasing consumption of alkaline-producing foods like fresh vegetables and fruit. Better supplement choices are also available to support the body’s acid buffering systems or to directly buffer acidic load. If you take dietary supplements, ask your local health food store for more information. Story Source: David Matteson is the co-founder of pH Sciences, and he focuses his creative energy on his consulting practice, Early Edge Solutions. Mr. Matteson holds degrees in education, public health, biology/engineering, and public policy and planning, and he is a current member of the Natural Products Foundation Board of Directors. The Natural Products Foundation has announce the recipients of the 2011 NPF Scholarship Fund: Lauren Atwell of Oregon State University and Linda Sousse of the University of Texas Medical Branch. Lauren Atwell is currently enrolled in the Nutrition Graduate Program at Oregon State University as a Ph.D. candidate. Ms. Atwell earned a Bachelor of Science degree in Dietetics and a Master's degree in Foods and Nutrition from the University of Georgia. She plans to pursue a career in research, and her academic interests involve investigating the relationships between nutrition and cancer processes at the molecular level. Currently, Ms. Atwell is researching a compound found in cruciferous vegetables, sulforaphane, and its effects on prostate cancer cells. Understanding cancer cell biology, testing gene-nutrient interactions, and uncovering cell signaling mechanisms are key elements to defining the relationships between nutrient metabolism and cancer. Her future research ambitions include study of nutrient and gene interactions in relation to cancer prevention and treatment. Linda Sousse recently completed her Ph.D. at the University of Texas Medical Branch in March 2011. Ms. Sousse completed a Bachelor of Science degree in Biology and Chemistry from Texas A&M University-Corpus Christi, and attended a Master’s program in Business Administration at Texas A&M. She currently studies in the Department of Pathology, conducting research focusing on inhalation injury in burn victims. On the strength of her dissertation work, she recently had two first author manuscripts accepted, focusing on oxidative stress and the arginase:nitric oxide synthase pathway. Ms. Sousse has presented research at two international and two national conferences: International Society for Burn Injuries in Istanbul, Turkey in July 2010 and Trauma, Shock, Inflammation, and Sepsis in Munich, Germany in March 2010, as well as the American Burn Association in March 2010 and the Shock Society in June 2009. She will be pursuing a post-doctorate education at the Linus Pauling Institute of Oregon State University. NPF will once again open applications to the Scholarship Fund at the end of 2011 through early 2012. Individuals and companies interested in making a contribution to the Scholarship Fund, please click here: NPF Scholarship Contributions. If you have any questions about the Scholarship Fund, or how you might become involved in NPF educational efforts, please direct questions to NPF Executive Director Deb Knowles: (202) 223-0101 ext. 115. One of the most prevalent trends in the natural products industry has been the rapid ascent of protein as a dietary supplement. A major breakthrough in understanding protein occurred with the discovery that amino acids functioned as unique nutrient signals to trigger healthy metabolism. Amino acids are more than simply building blocks for new proteins. Their role in maintaining healthy metabolism helps to set a solid baseline for overall health as we age. Our bodies are constantly repairing and rebuilding lean tissues, including muscles and bones. We need adequate protein to do so properly. Protein significantly helps to protect our bodies from age-related diseases including obesity, diabetes, muscle wasting, bone loss, and heart disease. Protein is important in determining body composition by protecting lean tissues such as muscle and bones and eliminating body fat. Protein stimulates the body to burn extra calories, reduces hunger, and helps stabilize blood sugar. These metabolic roles are important to adult health and for treatment or prevention of obesity and diabetes. By simply maintaining an even, healthy metabolism as we age, our society may be able to turn the tide on conditions which have plagued us with increasing frequency for decades. The benefits of protein are only realized if protein is provided in the right amounts, in the right quality, and at the right time. In order to trigger muscle repair and rebuilding, adults require about 30 grams of protein. If the protein comes from animal proteins such as whey or egg proteins, then 25 grams is adequate; if it comes from plant proteins such as wheat or soy, 35 grams are required. Protein consumed early in the day has the greatest impact on body composition, hunger, and blood glucose. Early and consistent day-to-day intake is ideal. By helping to maintaining a simple, steady metabolic baseline and healthy bones and muscles, protein can be a vital cornerstone for ongoing well-being. Proper education and application will be key to protein’s future as dietary supplement. Story Source: The above story is reprinted (with editorial adaptations by NPF staff) from materials provided by Donald K. Layman, Ph.D. Professor Emeritus, Department of Food Science & Human Nutrition at the University of Illinois, Urbana, Illinois. Natural Products Foundation (NPF) representatives met with Richard Cleland of the Federal Trade Commission (FTC) along with Gary Coody and others of the US Food and Drug Administration (FDA) on May 20th to present documentation regarding 13 non-compliant advertisers who have failed to amend their marketing materials after being contacted by NPF’s Truth in Advertising program. NPF requested that the regulatory agencies take action against those companies. Marc Ullman, of Ullman, Shapiro & Ullman LLC, NPF Legal Advisory Council Chairman, led the meetings. He was joined by NPF President John Gay and NPF board member David Brown, CEO of LifeVantage Corporation. The meetings focused on the recent progress of NPF Truth in Advertising efforts. Over the past 12 months, the Truth in Advertising initiative has mailed 77 warning letters to companies marketing dietary supplements making drug and disease claims. A large majority of advertisers contacted under the Truth in Advertising program have brought their language into compliance. The Truth in Advertising Program works to educate publishers, manufacturers, suppliers, and retailers to help ensure that the information presented to consumers concerning dietary supplements is truthful and not misleading. The Truth in Advertising review process targets non-compliant dietary supplement ads that claim to treat or mitigate disease. The companies responsible for these ads are contacted and informed as to how their marketing materials are illegal. The majority of the time those companies bring their promotional materials into compliance. When they refuse or fail to amend their practices, NPF passes the information to FDA and FTC. NPF staff continues to monitor the advertisements of companies who have made drug and disease claims in the past. One of the companies referred to the regulatory agencies had briefly amended their ad materials after contact from the Truth in Advertising program, and then reverted to making non-compliant drug claims. “The goal is a level playing field for the responsible core of the industry, as well as making sure fringe companies aren’t misleading consumers,” said NPF Executive Director Deb Knowles. The Truth in Advertising review process is initiated by NPF staff members under the supervision of the NPF Legal Advisory Council. The current Legal Advisory Council members are Mr. Ullman (Ullman, Shapiro & Ullman), Jackie Kuler (Gronek & Associates, Chicago), and Nicholas Licato (Nexgen Pharma, General Counsel). NPF Truth in Advertising efforts addressed 60 individual advertising cases in 2010. In 50 of the cases, the organizations responsible for the advertisements received explicit warning letters from NPF. During the 2010 Truth in Advertising campaign, NPF notified the FTC of 12 companies who were out of compliance and unwilling to amend their practices. The Natural Products Foundation and Carlson Laboratories are pleased to announce a partnership effort for Carlson Super Omega-3 Gems, a popular and award-winning product among Carlson’s complete line of omega-3 supplements. Part of the proceeds from the sale of each specially-labeled supplement will benefit the Natural Products Foundation, a not-for-profit organization dedicated to improving the future of natural health. “Carlson has always demonstrated support of industry initiatives, and this flagship program to fund industry research and education programs is an example of their commitment,” said NPF Executive Director Deb Knowles. Current medical research suggests that the omega-3’s EPA and DHA found in fish oil promote healthy brain, vision, joint, and cardiovascular health. For those who don’t eat an oily fish diet, Carlson Super Omega-3 Gems is a convenient alternative. The specially labeled Super Omega-3 Gems supplements displaying the Natural Products Foundation logo will be available at fine natural health stores nationwide from May 2011 through August 2011. Since 1965, Carlson Laboratories has been in the forefront acting as innovators in the nutritional supplement industry. Realizing the importance of omega-3’s early on, Carlson Laboratories began educating retailers and consumers about the health benefits of fish oil. Acting on a wealth of knowledge, Carlson was one of the first companies to bring liquid Norwegian cod liver oil and liquid Norwegian fish oils to the United States market. The mission of the Natural Products Foundation is to promote and facilitate research and education related to natural products for the benefit of consumers and industry. Partners in natural health, Carlson Laboratories and the Natural Products Foundation are working together to improve the longevity and well-being of all health-conscious consumers. To learn more, visit www.naturalproductsinfo.org/carlson. It started with a cluster of research done on vitamin K in the early 2000s. A 2003 study in the American Journal of Clinical Nutrition found low dietary intake of vitamin K was associated with low bone mineral density in women, which validated similar outcomes in other studies and associations between low vitamin K intake and a higher risk of hip fracture. A year later, the same journal published a study showing girls with a better vitamin K status had better bone turnover. But bone health wasn’t the only association researchers noticed. Over the next few years, studies on vitamin K would show associations between high vitamin K status and reduced risk of prostate, lung, and liver cancers, and protection against coronary heart disease. Story Source: The above story is reprinted from materials provided by Erin Kelley, MS, RD, Technical Marketing Manager at Vitamer Labs. References: Booth SL, et al. Vitamin K intake and bone mineral density in women and men. Am J Clin Nutr 2003;77:512-6. Kalkwarf HJ, et al. Vitamin K, bone turnover, and bone mass in girls. Am J Clin Nutr 2004;80:1075– 80. Geleijnse JM, et al. Dietary Intake of Menaquinone Is Associated with a Reduced Risk of Coronary Heart Disease: The Rotterdam Study. J. Nutr. 134: 3100–3105, 2004. Nimptsch, K. Dietary intake of vitamin K and risk of prostate cancer in the Heidelberg cohort of the European Prospective Investigation into Cancer and Nutrition (EPIC-Heidelberg). Am J Clin Nutr 2008;87:985–92. New Hope Natural Media will name the first recipients of the Foundation Scholarship Fund at the June 2011 Natural Products Association MarketPlace, in Las Vegas. The announcement will come just before the address of Keynote Speaker Dr. Tieraona Low Dog, on Friday, June 24. This will be the first year the scholarship has been awarded. The Foundation will once again open applications to the Scholarship Fund at the end of 2011 through early 2012. The Foundation is actively working to help members of the community meet their professional objectives. A vital part of our efforts include continuing education. By encouraging academic excellence and advancement within the natural products field, the Foundation intends to strengthen the professionalism of the industry and support knowledgeable leadership for the future. Financial need: Applicants must be able to demonstrate personal need for financial aid. Academic achievement: The applicant must show the ability to accomplish high academic achievement, demonstrated by previous test scores, grades in other courses, or professional achievement. Leadership: Applicants must demonstrate fundamental leadership skills. There’s nothing like the smell of a new car. You never forget the day you drive your first one off the lot—everything running well, the engine smoothly purring because the catalytic converter is cleaning up the toxic byproducts, or exhaust, produced by the engine. But eventually your new car becomes your old car, the catalytic converter becomes less effective, the exhaust isn’t very clean anymore and the engine suffers wear and tear. Our cells are like car engines. They have the same combustion process, produce some of the same byproducts and clean up with similar catalytic converters. When we’re young our enzymes, our cells’ catalytic converters, function well and do a good job cleaning the toxic byproducts our bodies generate living life. But unfortunately, like cars, our bodies don’t always function like new. As we age our bodies produce more free radicals and less of the special enzymes that fight them. This leads to oxidative stress. Oxidative stress is caused by free radicals, molecules that outside the human body cause metal to rust or sliced apples to brown. Free radicals are molecules missing a simple electron in search of another molecule they can combine with to become “whole.” They, with many components of cells and the structures around them, cause “rusting” as the free radicals wildly search for mates. The more free radicals in the body, the more damage they do. The most effective way to fight free radicals is to trigger the body to produce its own free radical-fighting enzymes. While one antioxidant molecule can fight only one or two free radicals before it is depleted, the body’s free radical-fighting enzymes can each eliminate up to one million molecules per second, every second, without being used up in the process. Enzymes produce pure antioxidant protection, moving through your system, pairing up electrons to eliminate free radicals throughout your body and allowing your body to safely eliminate them—keeping your primary vehicle, your body, running well, a true “classic”—able to withstand the “rusting” of aging and taking you where you want to go for many years to come. Story Source: David Brown is the current President and CEO of LifeVantage Corporation. Mr. Brown earned his Juris Doctor degree from Cornell University, and is a current member of the Natural Products Foundation Board of Directors. Mr. Ullman, Chairman of the Foundation Legal Advisory Council, will be honored with an Industry Champion Award at the Natural Products Association Marketplace, which will be held June 23-25 in Las Vegas. Marc S. Ullman is widely recognized as one of the natural product industry’s legal authorities and an ardent supporter of the Dietary Supplement Health and Education Act (DSHEA). His practice, Ullman, Shapiro & Ullman represents clients on a variety of issues related to Food and Drug Administration (FDA) compliance, including the scope of the agency’s powers under DSHEA. He also advises clients on health claims concerning diseases, FDA’s new dietary ingredient (NDI) process, and generally recognized as safe (GRAS) status. NPA Honors America's Champions for Natural Products. Johanna Arnone has written a very nice editorial in the latest Remedies for Life: Buyer's Edge about the Foundation's Truth in Advertising Program. Check it out by clicking on the image below! (Washington, D. C.) — The Natural Products Foundation self-regulatory efforts addressed 60 individual advertising cases in 2010. In 50 of the cases, the organizations responsible for the advertisements received explicit warning letters from the Foundation. The Foundation’s Truth in Advertising program is a unique industry initiative targeting non-compliant dietary supplement advertisements that claim to treat or mitigate disease. Using the guidelines laid out for the industry under the FD&C Act (as amended by DSHEA), the Foundation helps advertisers, retailers, suppliers, and publishers to present accurate, honest advertising. By engaging directly with organizations that have problematic advertising practices, the Foundation aims to eliminate any advertisements that undermine the reputation of the natural products industry. A large majority of companies receiving notifications from the Foundation have responded in a positive fashion, correcting problems identified by NPF’s Legal Advisory Council. "We are extremely encouraged by the feedback and responses we have received for the Truth in Advertising program," said Deb Knowles, Executive Director of the Foundation. "Many of the problems we face have simple remedies, and most companies are happy to adjust and revamp ads when necessary. Their willingness to do the right thing makes our job that much easier. The Foundation wants to make sure that good, honest supplement companies aren't capsized by misguided claims and promotions." To achieve better industry practices, the Foundation works closely with federal regulatory agencies to bring their attention to advertisers who continue to run illegal and harmful advertising. During the 2010 Truth in Advertising campaign, the Foundation notified the Federal Trade Commission (FTC) of 12 companies who were out of compliance and unwilling to amend their practices. "We identify cases of non-compliant dietary supplement advertising and attempt to assist the companies involved in correcting their ads," said John Gay, President of the Natural Products Foundation. "However, when companies refuse to bring their ads into compliance, direct regulatory action needs to be taken." The Truth in Advertising Program has received support from industry insiders and federal representatives. A broad range of educational information for dietary supplement advertisers is provided on the Foundation’s website to assist companies in need of guidance: Truth in Advertising Resources. NPF advertising compliance reviews are available by request online: Truth in Advertising Review. The Natural Products Foundation (NPF) is pleased to announce a 2011 scholarship award for students and industry members interested in pursuing a career in a natural products-related field. By assisting members of the community to meet their professional objectives, the Natural Products Foundation will continue to bolster the future success and advancement of natural products. Applicants must fill out a preliminary application online: Natural Products Foundation Scholarship Fund Application. In addition, two letters of recommendation from teachers or employers will be required. To be eligible for the NPF scholarship, applicants must be a resident of the United States. Applications will be accepted beginning January 5, 2011 and must be completed by February 5, 2011. Top finalists will be determined by the NPF Scholarship Award Committee and will be assessed during a telephone interview to take place in March 2011. Award winners will be notified by May 1, 2011 and will be announced at the Natural Products Association MarketPlace in 2011. Please direct questions to Deb Knowles, Executive Director, Natural Products Foundation, debknowles@naturalproductsfoundation.org, or (941) 349-9044.